The drive is deliberately stackable, and designed to operate cooler than the first-generation model, OWC said. Up to six ThunderBlades and/or other Thunderbolt devices can be linked together, whether for use separately or in a RAID configuration. The product comes in capacities up to 8 terabytes. Transfer normally peak at 2.8 gigabytes per second, but joining multiple drives together via SoftRAID can push performance up to 3.8 gigabytes. 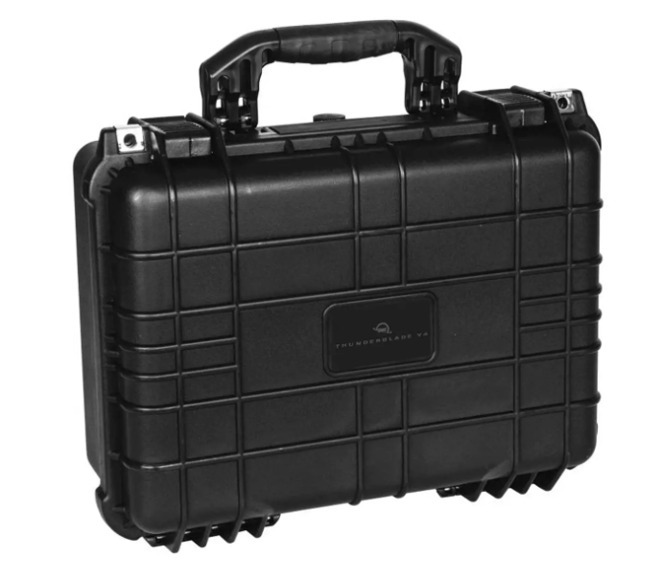 For durability OWC is offering not just a rugged design, but a free ballistic hard-shell carrying case with each order. Prices for the ThunderBlade start at $799 for a 1-terabyte model. 2- and 4-terabyte models are $1,199 and $1,899, respectively, but the cost for 8 terabytes jumps to $3,499. Now we're talking...except, after the exchange rate, GST, etc...A$1249 for 1TB. That's a lot of money. It's cheaper than the Samsung X5, but not by much. I paid $2,400 for my 12TB Promise Thunderbolt 2 RAID array back in 2015 for my iMac. The six drives I have in it still cannot saturate the TB2. I'm really impressed with the performance of this new TB3 SSD unit. It's pretty amazing how fast technology has evolved since then. I would seriously consider the 8TB version.. the only caveat is that the single SSD unit is technically less reliable than my 6-drive enclosure. I wouldn't sweat too much if I had a drive fail in my RAID array, but I'd be sh----g bricks if my 8TB SSD drive failed. I'd love to see a full TB3 SSD-only RAID enclosure. Having that much bandwidth available with drives that can push that kind of data is just amazing. Look at the OWC Express 4M2 NVMe enclosure. It came up in a discussion on one of the earlier threads about external SSDs. 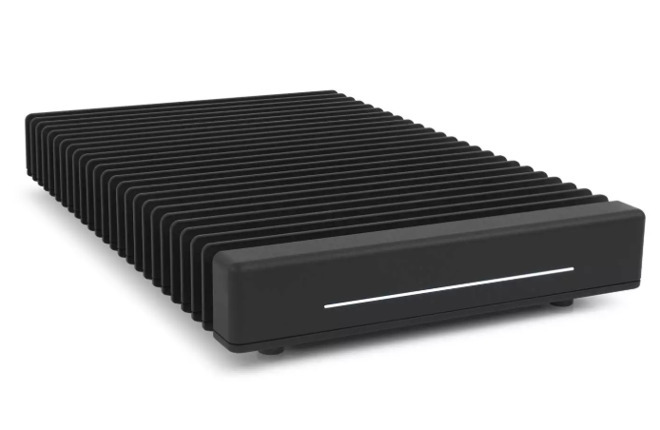 It takes 4 NVMe SSDs and uses Thunderbolt 3 connectivity. On the OWC webpage it says this is compatible with Mac and Windows but the rear view image shows two Thunderbolt ports, that's it. I haven't seen many Windows machines with Thunderbolt capability. I guess Dell makes a couple laptops and one from HP that have Thunderbolt 3. None of them have very good ratings though. I would have thought that they might have included USB-C ports as well. Their OWC SoftRaid software is Mac only. I guess they support Windows Storage Spaces which I have read is pretty reliable and fast. Anyway I need to unsubscribe from OWC email spamming. I never signed up for automatic emails although I did buy some stuff from them and provided my email. Some guy named Larry emails me several times per week. It is just easier to delete them than to open it and find the unsubscribe link. Thanks for the tip! I didn't there was something out there. It's good to know as I would definitely want to get something down the road. I checked out the reviews and some videos about it and it definitely has a v1.0 appearance to it. I'm looking forward to seeing what's in the roadmap for more streamlined, efficient versions. Very nice. I like the thin form factor of SSD. It's about the same throughput as my Mac mini 2018's internal flash drive. But it's super expensive though. I'll stick with my USB 3 external hard drives for the next several years until SSD $$$$ drops. Intel's entire NUC line has Thunderbolt 3, and nearly everything at CES this year did as well. Anyway, in theory, OWC could have used Titan Ridge which has fall-back to USB 3.1 type C connection and speeds, but the entire reason this drive exists is to pump data out more than twice as fast as USB 3.1 Type C allows. Right tool for the right job. ...but the entire reason this drive exists is to pump data out more than twice as fast as USB 3.1 Type C allows. Read speed is not the problem. Write speeds with some sort of drive pooling is where performance is crucial. Windows Storage Spaces with USB-C 3.1 beats just about any hardware RAID in writes by almost double. Doesn’t really matter to me though because I’m all Mac. Not here. As I said above, the Samsung X5 is about A$100 more than the OWC. So, your milage may vary, as they say.